An Innovator in ecological architecture and urban design, researcher and architectural educator. Architect of ‘CO2-Saver’ House, educator and renowned expert on ecological constructions. Damian Przybyla – Architect, co-author of “Migrant Skyscraper” Evolo 2012, Poland. Design reveals critical, distinctive, high-quality, and innovative analysis of the competition theme with its clarity, quality of the model, very good presentation and beautiful rendering. The material enhances the design and the viewer can almost “feel” the material. The general concept comes from an assumption of vertical urbanism and leads to convincing architectural solution of open spaces, which may be perceived as main avenues, that connect complex functions of the vertical city. 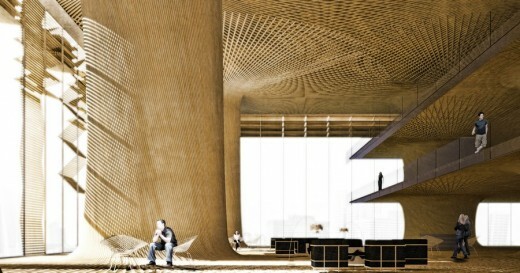 The authors analysed structural issues and looked for possible applications of the bamboo in such mega-structures. 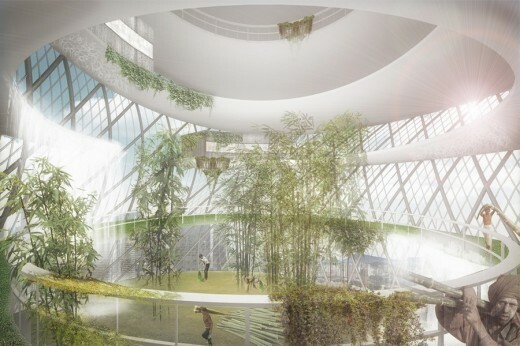 The result is an interesting re-interpretation of the usual concrete/steel frames using bamboo as a visible alternative to the steel and glass dominated skyscrapers. Concept shows a great combination of strong ideological basis and a pragmatic, well presented architectural solution that is exceptionally sensitive and inspiring. It is a successful implementation with proper relation to the place, good solutions for safety and functionality, great response to the climatic conditions of Singapore with sun protection with bamboo, stack effect, natural cross ventilation, water reuse system, analysis of regeneration of whole building, smart structural concept with good organisation of space. 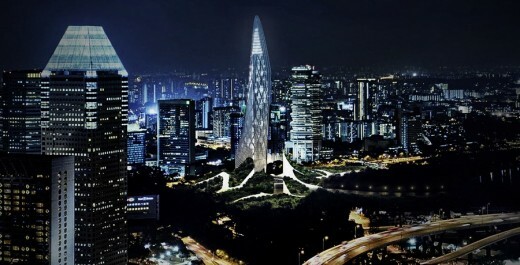 This project exhibits the quality of a real bamboo icon and a landmark for the city of Singapore. This project exhibits a strong awareness of possibilities of technology with a strong visual presentation that is rather witty, an unexpected concept with an amorphic form that correlates with attributes of bamboo as a building material (“elastic” skin). The visual affinity with bamboo structure results in a nice, friendly architecture drawing attention to need for water management. It is innovative in its approach of using environmental technologies and systems based on bamboo, however the structure, function and communication of all these expects could be clearer. 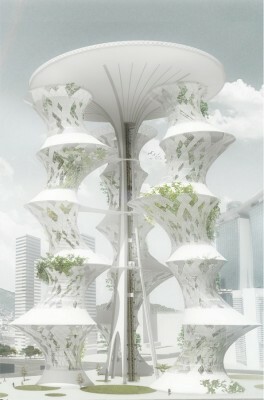 The project on the whole, presents a delightful concept for a bamboo skyscraper. 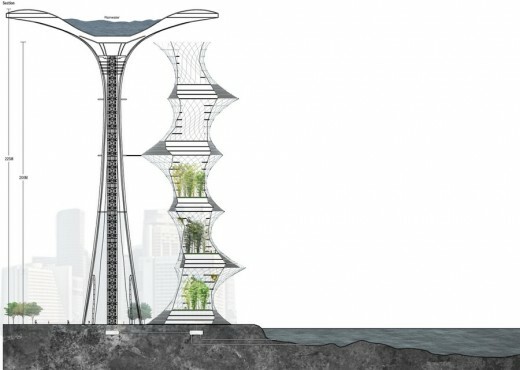 Despite the schematic way of its presentation, the concept has great potential. Authors look for inspiration within nature and transpose it into interesting architectural solution. The organic layout of the building has been redefined into spatial and structural solution with the density of bamboo pillars higher in the central parts of the building (higher parts) and decreases towards exterior. This principle bases on a structural analysis, but leads to interesting consequences regarding spatial and functional solutions. This building offers a soft spatial gradation between exterior and interior, there are no strict conventional walls, and in consequence building is integrated with a landscape. 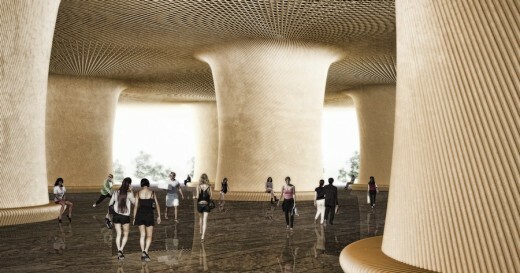 Interiors could be compared to bamboo forests filled with unified vertical elements. 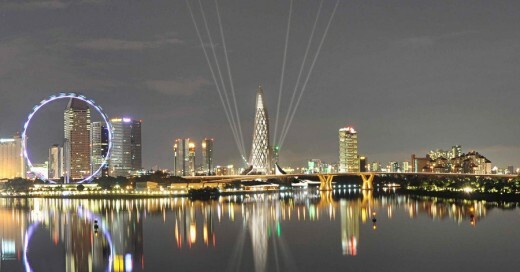 Concept is presented in laconic way, which lacks great architectural execution. It doesn’t solve any detailed functional and environmental issues, but it can be perceived as an inspiring starting point – an ideology that offers a wide range of further interpretations and possibilities for a convincing detailed architectural solution. 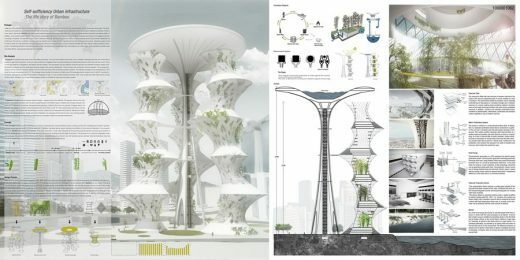 This proposal offers a plausible urban concept (Archipelago) with well thought out visual connections, very good presentation and coherent concept decreasing the environmental impact of the building: bio waste and water management, solar energy, natural ventilation (cool, green “cave” in the base of the building / stack effect), shading with bamboo elements, smart concept for wind energy harvesting and clear functional allocation. It is a sophisticated, innovative structural concept (the “backbone” and the “cells”) and plausible use of bamboo as a construction material, reasonable mixed with steel and glass. The slight disappointment is that bamboo is scarcely perceptible for the viewer outside of the building and the arbitrary, but pleasant form of the building. The proposal has potential for a landmark, however could exist on a site elsewhere. 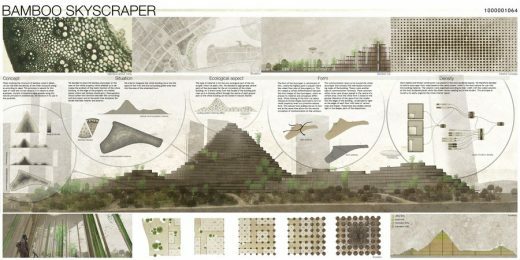 The program challenges participants to design a NEW Architect’s Village Bamboo Skyscraper that takes into account the need for a contemporary approach of bamboo construction in such an urban setting and also today’s ever-increasing need for ecological design principles. 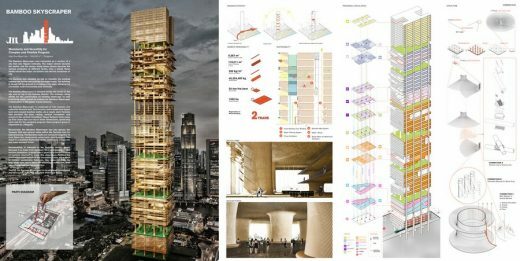 The design should be visually and aesthetically engaging in contributing to the wider investigation to the use and possibilities of bamboo in tall construction design. 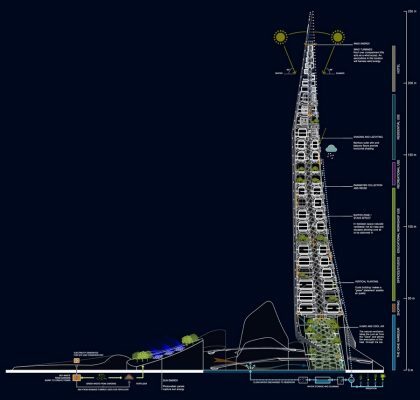 The new proposed skyscraper city should in general maximise positive impact of such a Vertical Structure and be an acceptable addition to the Singapore City Skyline. 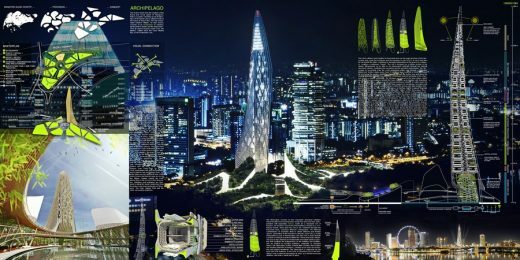 It should respond directly to the issue of sustainable and ecology space creation in a city such as Singapore and also address the social, environmental, cultural and economic issues and concerns of the ever-increasing construction of urban Skyscrapers. 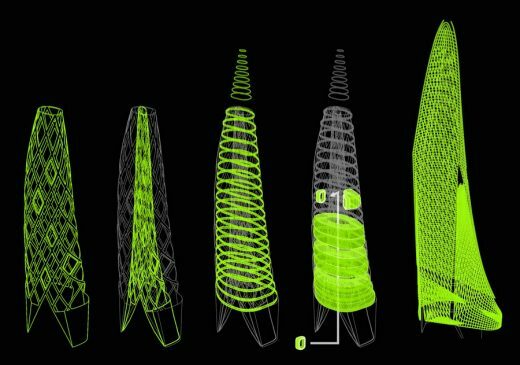 The design proposal must have bamboo as the dominant material as this is an investigation into innovative possibilities for bamboo as a material for tall construction design as support or covering (cladding) for such structures. We are also be interested in designs that push the possibilities for such a material by proposing the growing, slicing or reshaping and treatment of bamboo into fascinating shapes to be used for tall structure design.